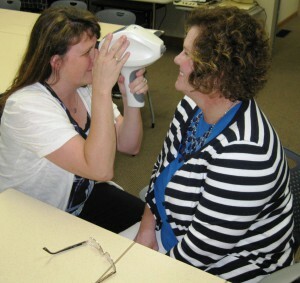 ABVI provides free Vision Acuity and Glaucoma screenings for “at-risk” adults throughout West Michigan. These individuals typically don’t seek professional eye care due to economic limitations. With generous help from Volunteers, we host weekly events at Food Pantries, Supper Houses, Public Housing, Churches and Healthcare events. We serve hundreds of adults annually and refer those in need of medical attention to eye care professionals. For more information, contact Linda Zizos at (616) 458-1187 or lzizos@abvimichigan.org.